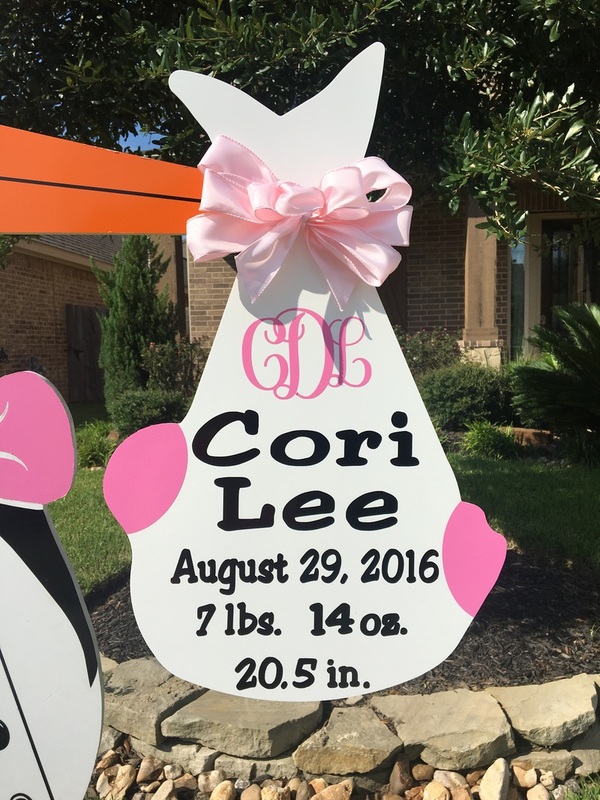 Bundles and Sibling Stars for Stork Signs Houston, Texas — One Sign Day: New Baby and Birthday Sign Rentals Houston, Texas area. Announce you new born baby with our stork bundles. They are customized with your new baby name, weight and length. don't forget to add a sibling star. One Sign Day Stork rental service offers personalized keepsake bundles for Stork lawn signs that look precious hanging on your front door, your hospital room door, or in the office to announce your new baby. Bundles typically include first and middle names, date of birth, weight, and length of the newborn. These keepsake bundles make a beautiful addition to the new baby's nursery and will be a cherished keepsake for years to come. They are also lovely additions to the front door of your baby shower or at a proud grandparent's house to celebrate a new grandchild. Do you live in an apartment or home without a front yard for a stork sign rental? Don't let that stop you from announcing your exciting news. Customized keepsake bundles are available for purchase and fit a variety of occasions. For an additional fee, we can add his/her monogram initials to any sign or bundle. Individual purchase of big brother and big sister sibling signs are also available as a special treat for proud brothers and sisters. One Sign Day also offers a Dog Bone sign so that no part of the family is left out. Stars are not only used for siblings, One sign day can customize any star to match your special occasion, whether you child is graduating, made that special dance team, anniversary or a welcome home sign. They can also be an addition to any birthday sign for an additional message.